Our hosts from two previous Januarys have invited us back again to enjoy their special garden packed full of all types of succulents along with some cacti and tropicals. It’s been a busy year; they removed a pool, pond, and large palm, and replaced them with two raised garden beds that now contain small succulents, elevated for easier viewing. 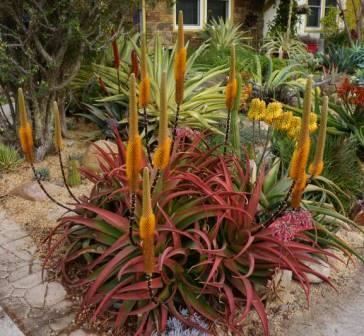 You’ll also enjoy their ever-expanding collection of Echeveria agavoides types, Aloes, Aeoniums, mesembs beginning to bloom, and Agave bovicornuta (Cowhorn Agave) in spike. Most plants are labeled in case you would like to grow them in your landscape. This year, Greg Starr (owner of Starr Nursery in Tuscon) will be visiting from Tucson to give short talks and sell plants from his nursery. Greg’s books include Cool Plants for Hot Gardens and Agaves: Living Sculptures for Landscapes and Containers, and he recently co-authored Field Guide to Cacti and Other Succulents of Arizona. 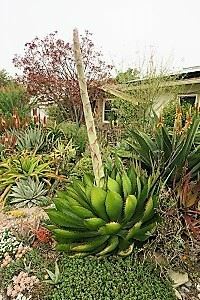 He travels throughout Mexico and is researching for a book on the agaves of Baja California. Greg is an advocate of mixing flowering plants with cacti and other succulents and he promotes this idea whenever possible. Greg has presented talks on agaves and desert plants in general throughout the United States and will be at Australia’s Succulenticon 2018. There will be home-baked goods, appetizers, and beverages in addition to the plants for sale (cash only, please) from Greg's extensive collection. We hope you will check out the gardens and plants, meet Greg, have some refreshments, and say hello!